On the heels of delivering new album Prequelle, Ghost have mapped out an extensive North American tour behind the disc. 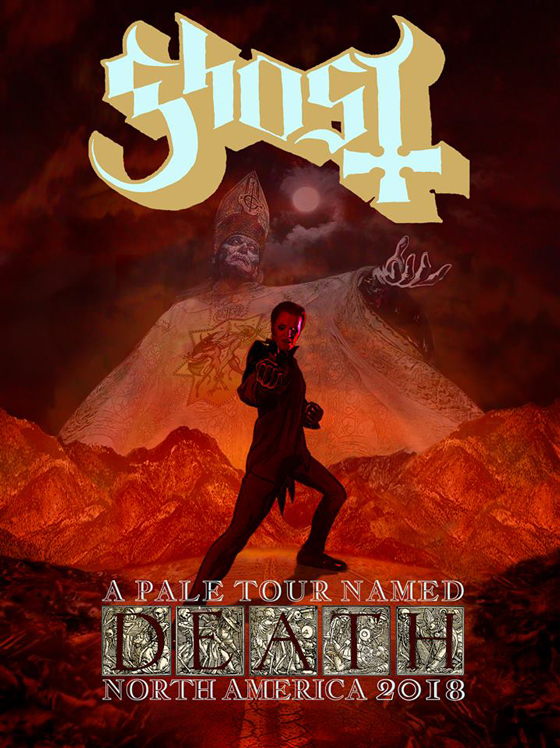 The "A Pale Tour Named Death" trek will kick off October 26 in Tulsa, OK, keeping the ghoulish metal group on the road until mid-December. A pair of Canadian dates will bring the band to Laval's Place Bell on December 7, before a show at Toronto's Sony Centre on December 8. Tickets for all dates will go on sale to the public June 15 at 10 a.m. local time, with pre-sales beginning June 12 at 10 a.m. local time. Further details on pre-sale and VIP packages can be found here. Find a complete itinerary below, and read our interview with bandleader Tobias Forge here. Earlier this month, Ghost cancelled a concert after an audience member passed away mid-set.